This is a quick tutorial about setting up Cypress to write some automated tests for use with UI5. I should start this blog with quite a shameful statement, one that I think many of my fellow UI5 developers are also guilty of for one reason or another. I haven't written a single test using the preferred UI5 testing frameworks, be it QUnit or OPA5. So knowing that I know absolutely nothing about testing applications in UI5 I decided to look into it. I could have gone towards QUnit and OPA5 and I likely still will look into those in the near future. However, I had recently heard about Cypress and decided that It looked powerful, easy and has quite a few nice features. If you already have a project where you want to test out Cypress then go ahead and skip to "install Cypress on your project" otherwise follow the below steps. follow the on-screen prompts selecting the template "master-detail-flexible-columns" and filling in your project name and project namespace accordingly. This template at the time of writing isn't perfect/ complete but I've deployed it regardless as it's really only missing some cleanup. This will then download and install Cypress into your project folder and it will automatically create a number of example tests for you. We mostly only care about the folder called "integration" for now as that's where all the tests for this application will sit. cy.contains('Master Header').should('be.visible') //change text inside of contains relevant to some text seen in your applcation. It's important to note that you will need to change the URL for cy.visit to match the URL of your application, I use a local webserver called Valet which uses DnsMasq which proxies all of my requests to *.test domain to my local file system but you might have something simpler like "http://localhost:8080/yourApplicationDirectory/webapp/". Congratulations! 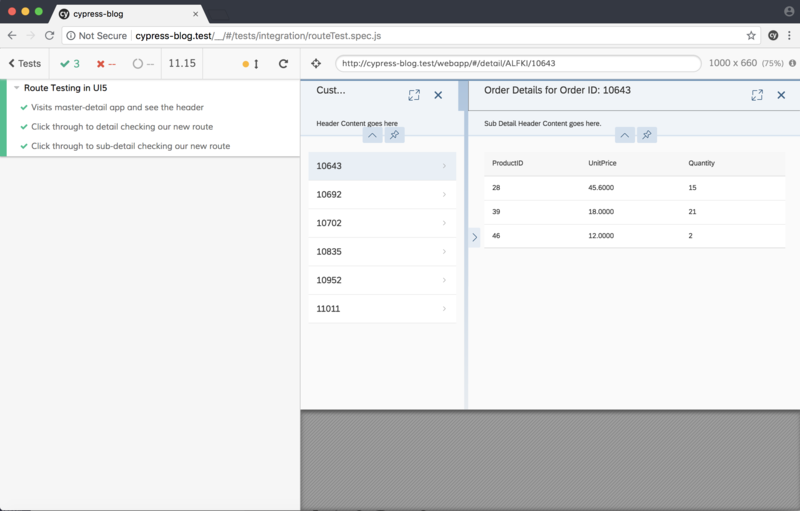 we've ran our first passing test using Cypress for UI5! We want to test our routing inside of our UI5 application, so to do this with a master-detail application we need to make use of some ODATA. The application I have is setup to use Northwind (a public ODATA service provided by Microsoft) so I'm going to use examples in my tests that look for data that I'm aware of coming from Northwind. The above test has a few different things going on, at the top of the test we define 2 routes/ XHR requests that we're going to look out for. These two requests are our metadata request (triggered first, and needs to complete before our other request will take place) and our customerRequest request which returns a list of customers. Then once loaded I know that Northwind will return the data of "Maria" and I can instruct Cypress to click Maria which will then kick off the navigation to my detail page which we check for in my final line to see the URL change which completes our test. Most of the above is exactly the same as our previous test, but we're going to the next level/ end column of our master-detail application. We skip part of the previous tests checks/ waiting around because we instead visit our detail page directly but otherwise it's pretty much the same test but on the last level. We have 3 tests all of which hit our routes so we know that nothing has gone horribly wrong with our application! Now It's quite obvious that the fact that all 3 tests took about 11 seconds (I've had much worse from Northwind) to run isn't exactly ideal, however that's mostly down to the Northwind data service used and so would be quicker in real world examples. Running tests in parallel is also something that you can do/ can setup with some time so I don't really think that tests will take too long to run in the long term/ a proper setup. I hope that this has been a quick and easy introduction to using Cypress with UI5 and how easily you can get into automated testing. I think that Cypress is an excellent tool and it's only in Beta at the time of writing but I can already see it becoming a popular testing tool among projects and teams alike. Questions? Comments or Concerns? Let me known down below in the comments or on my Twitter.